(Nanowerk News) Chemists and physicists of Radboud University managed to open and close nanovesicles using a magnet. 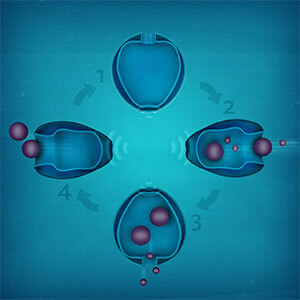 This process is repeatable and can be controlled remotely, allowing targeted drug transport in the body, for example. Nanovesicles for transporting drugs to correct locations in the body - that's the idea. On 24 September, chemists and physicists from Radboud University will publish results from a seminal intermediate step in Nature Communications: they have managed to open the vesicles in a reversible process and close them using a magnet. 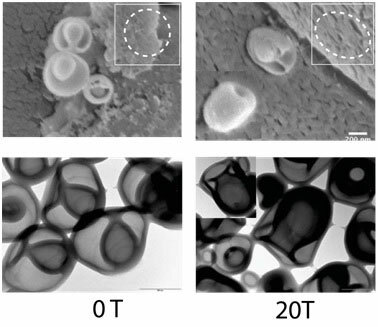 Figure 1: Electron microscope images of the vesicles. Without a magnetic field (0 Tesla, left), the vesicles have a small opening. In a strong magnetic field (Tesla 20, right), they are deformed by the magnetic alignment, resulting in a large opening of the vesicle. The nanovesicles look like minuscule, indented balloons. It had already been possible to 'load' them with a drug and open them elsewhere. But this was done using a chemical process, for example using osmosis. Researchers at the Nijmegen Institute for Molecules and Materials (IMM) have now demonstrated the viability of another method. They have stretched the walls of the vesicles by aligning the molecules in the wall using the strong magnets of the High Field Magnet Laboratory (HFML). Because the strength of the magnetic field is precisely linked to the size of the vesicles, the deformation can be controlled more easily. It is the first time that researchers have managed to make this process reversible: without the magnetic field, the vesicles close, and they open when the field is turned on. After switching the field off, they return to a closed state. This process is repeatable and can be regulated remotely. Figure 2. Without the magnetic field the vesicle is closed (1) and when the field is turned on it opens (2) so that it can be loaded with cargo. After switching the field off, the vesicle returns to a closed state (convenient for transport) and by increasing the magnetic field it opens again to release its cargo (3 and 4).